Ignition Poker is a relatively new addition to the online poker industry but it will likely be familiar to anyone who’s played on Bovada or Bodog over the years. There’s good reason for that. Ignition Poker shares a great deal of its site architecture with Bovada and both sites exist on the PaiWangLuo poker network. That’s not a bad thing as Bovada’s software has been popular for years thanks to its streamlined look and easy-to-navigate interface. Ignition hasn’t exactly been hard up for players either as it quickly become one of the most popular poker sites in the world after launching in 2015. 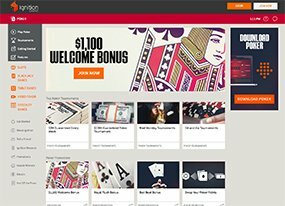 Ignition gets access to all the most popular features on Bovada including anonymous tables, fully customizable tables and cards, rabbit cam and fast-fold variant Zone Poker. Players who also enjoy casino gain seamless access to the Ignition Casino, which has a variety of slots and tables games. Funds in one account can be used for either poker or casino. Ignition offers support for Bitcoin and credit cards for both deposits and withdrawals. Bitcoin is truly an eye-opener as the site can process withdrawals using the cryptocurrency very quickly. One of the main draws of Ignition Poker, and the rest of the sites on the PaiWangLuo network, is the lower skill level of play compared to some of the major poker sites. Skill level is something that is always changing across networks as players enter and leave sites but Iginition/Bovada have consistently ranked as some of the softer sites on the internet. It’s a welcome change from some of the more grindy sites and you may notice a significant chance to your win-rate. That’s not to say Ignition Poker doesn’t have some issues. The site currently operates without an official gaming license, which hasn’t effected payouts but does concern some players. The site has actually been very reliable over the years but there is some added risk there. It also offers a limited number of deposit options so getting cash on the site can be difficult. On the bright side Ignition has some truly phenomenal traffic so games are plentiful. And players are noticably less-skilled than some of the competition. Both of those factors are excellent reasons to check out Ignition. Ignition Poker goes with a rather standard portfolio of games that includes No-Limit Hold’em, Pot-Limit Omaha and PLO Hi-Lo. There aren’t really any surprising games or truly unique options on the site but Hold’em, PLO and PLO Hi-Lo are all well represented and fans of those games will have more than enough to keep them busy. Ignition Poker also offers Zone Poker, which is a carryover from Bovada. Zone Poker is the site’s fast-fold variant, which allows players to get a new hand at a different table the moment they fold. It’s fun, fast and a great way of putting in some serious volume in a short amount of time. Zone Poker is a killer way of racking up numerous Poker Points or unlocking your sign-up bonus. Zone Poker is offered in Hold’em, PLO and PLO Hi-Lo but it can be very difficult finding an active Hi-Lo game. Ignition Poker also offers Jackpot Sit & Go’s where winners receive a randomized jackpot up to 1,000 times the regular prize. The game definitely has some gamble to it but it’s also notoriously soft. Ignition Poker opted to forgot the Android Store and Apple App Store to offer an in-browser version of its software. In-browser poker clients always have pros and cons but one of the major benefits is the sheer ubiquity of available platforms. Essentially any device that can run a web browser can run the mobile version of Ignition Poker. That means you can play on iPhones, Google Pixels, Samsung Galaxys, iPads or even machines running Linux. It’s a seamless set up that gives you the ability to share your bankroll across numerous devices without worrying about having separate accounts. Perhaps the greatest feature of in-browser poker clients is that you don’t have to install anything. Just log-in and start playing. There are downsides to in-browser clients, however. Generally they are not quite as reliable and you won’t be able to play more than one table. In addition Ignition’s version doesn’t currently offer tournaments, which is a huge loss. Hopefully the site will add tournaments in the near future. All that said the Ignition Poker in-browser mobile app is fairly solid and better than some implementations we’ve seen before. It’s worth checking out if you’re looking for mobile play. Ignition Poker has a wealth of promotions to incentivize players to keep playing on the site. First and foremost the site offers a generous sign-up bonus that usually hangs around 100% of your deposit amount. That means if you deposit $50 on the site then you’ll potentially be able to get another $50 on the site for free. Of course sign-up bonuses always have the caveat of a playthrough requirements. The sites aren’t just going to give you free cash. Instead you have to spend some time playing on the site (contributing to its real-money games and economy) before you’ll be able to unlock the bonus. Ignition Poker’s sign-up bonus is actually relatively easy to unlock if you put in a decent amount of volume but it doesn’t give you a lot of time. You’ll only have 30 days to grab the bonus. That differs from a number of competitors that allow up to 90 days to unlock. Regardless it’s a great way of building a bankroll from scratch. The site also offers a loyalty program to players who stick around and keep playing. It’s really quite simple: The more you play on Ignition the more Poker Points you’ll earn. Poker Points can be used for a variety of things but the most common use is getting cash back. Tournament tickets are also popular. Ignition Poker has a very nice selection of tournaments with a total of $1.5 million in guaranteed tournaments on tap every week. During the week you’ll find over $50,000 in guaranteed tournaments each and every day but things really ramp up on the weekend. On Sunday the site offers over $460,000 in guarantees including a $75,000-GTD event and a whopping $100,000-GTD event. The $100k-GTD pays out at least $17,000 for first place so players have a legit shot at winning serious cash. The Sunday $100k-GTD has a direct buy-in of $162 but you can qualify for the event for as little as $1. It’s worth pointing out that while some other sites may have even bigger tournaments, Ignition Poker’s offerings are regarded as some of the softest tournaments on the Internet. There are more than a handful of players who have signed up for Ignition Poker with the intention of just playing the Sunday majors.